The International Union for Conservation of Nature (IUCN) is a global environmental organization with a membership of more than 1,000 governmental and non-governmental organizations, over 1,000 professional staff in 60 offices worldwide, and about 11,000 volunteer scientists in more than 160 nations. Over 80 nations and 100 government offices have membership in the IUCN and about 90 international NGOs. Known fully as the International Union for Conservation of Nature and Natural Resources, from 1990 to March 2008 it was commonly known as the World Conservation Union, although this shortened name is no longer commonly used. Formed in October 1948, the IUCN's headquarters is located in the Lake Geneva area in Gland, Switzerland. Among the IUCN key products and services, it has produced and continues to maintain and monitor the IUCN Red List of Threatened Species and the IUCN categories for Protected Area Management. The IUCN was involved in formation of the Convention on International Trade in Endangered Species of Wild Fauna and Flora (CITES) and the Convention on Wetlands of International Importance (Ramsar Convention), and Ramsar's secretariat is administered from the IUCN headquarters, while the CITES secretariat was originally housed within IUCN. The IUCN has official observer status at the United Nations General Assembly. The formation of the IUCN six decades ago as the world's first global conservation organization, and the formation of other national- and international-level conservation organizations, reflects a growing sensitivity to nature on the part of people who often in history have dominated for immediate and self-centered gain. The IUCN promotes a longer term and mutually beneficial view towards the planet's flora and fauna. The IUCN considers itself the world’s largest and oldest global environmental network. It has a democratic membership that includes, as of March 2008, 84 states, 111 government agencies, 785 national non-governmental organizations (NGOs), 89 international NGOs, and 35 affiliates. For example, on October 23, 2008, Mexico joined as a state member of IUCN. The IUCN also includes about 11,000 voluntary scientists and experts, which are grouped into six commissions. It has offices in 62 countries, staffed by 1,000 full-time personnel (IUCN 2008). The IUCN's mission is "to influence, encourage and assist societies throughout the world to conserve the integrity and diversity of nature and to ensure that any use of natural resources is equitable and ecologically sustainable" (IUCN 2008). Dedicated to natural resource conservation, and a leading authority on the environment and sustainable development, the IUCN conducts thousands of field projects and activities around the world. Well-known among its projects is the IUCN Red List of Threatened Species, also known as the IUCN Red List or Red Data List. Created in 1963, it is the world's most comprehensive inventory of the global conservation status of plant and animal species. Species are classified in nine groups: Extinct, Extinct in the Wild, Critically Endangered, Endangered, Vulnerable, Near Threatened, Least Concern, Data Deficient, and Not Evaluated. The IUCN is funded by governments, multilateral and bilateral agencies, foundations, member organizations, and corporations. There has been criticism that although the IUCN is the world's main authority on the conservation status of species, its recommendations are not always based on sound and open science (Mrosovsky 1997). Criticism of secrecy regarding the sources of data for the IUCN Red List, or at least poor documentation, led to improvements in the IUCN's documentation and data quality and inclusion of peer reviews of taxa. The first Director General of UNESCO, (Sir Julian Huxley), wishing to give UNESCO a more scientific base, sponsored a congress to establish a new environmental institution to help serve this purpose (Christoffersen 1994). At that first congress (held at Fontainebleau, France), on October 5, 1948, 18 governments, 7 international organisztions, and 107 national nature conservation organizations all agreed to form the institution and signed a "constitutive act" creating an International Union for the Protection of Nature, or IUPN (Christoffersen 1994). From this beginning, the overriding strategy and policy of the institution has been to explore and promote mutually beneficial conservation arrangements that suit those promoting development as well as assisting people and nations to better preserve their flora and fauna (Christoffersen 1994). The IUCN's World Conservation Strategy (1980) was founded upon this kind of principle, and clearly announced the IUCN's ambitions to more effectively enter into dialogue with the promoters of human development. The strategy was internationally applauded by many and served to secure the IUCN funds from several donors who did not themselves feel they could open up effective dialogue in the world's developing countries, nor that United Nations organizations and international banks would effectively engage in such dialogue (Christoffersen 1994). 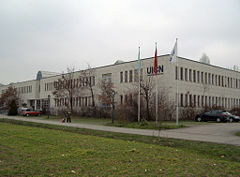 The IUCN has now expanded into many of the nations around the world, making available the services of a large pool of mainly voluntary specialists, providing local level advice and conservation services, and expanding its networks of Committees and regional advisory bodies into increasing numbers of countries (Christoffersen 1994). 1948: Founded as the world’s first global environmental organization, the International Union for the Preservation of Nature (IUPN). 1969: The IUCN obtains a grant from the Ford Foundation, which enables it to boost substantially its international secretariat. The Union has three components: its member organizations, its six scientific commissions, and its professional secretariat. Overall governance is by a Council elected by member organizations every four years at the IUCN World Conservation Congress (IUCN 2008). The Union unites both States and non-governmental organizations. They set the policies of the Union, define its global programme of work and elect its Council (comparable to a company board). Member organizations organize themselves into National and Regional Committees (IUCN 2008). IUCN Commission on Ecosystem Management (CEM): CEM provides expert guidance on integrated ecosystem approaches to the management of natural and modified ecosystems. Of of May 2008, it has 400 members. IUCN Commission of Education and Communication (CEC): CEC champions the strategic use of communication and education to empower and educate stakeholders for the sustainable use of natural resources. As of May 2008, the commission claims 500 members. IUCN Commission on Environmental, Economic and Social Policy (CEESP): CEESP provides expertise and policy advice on economic and social factors for the conservation and sustainable use of biological diversity. As of May 2008, CEESP has 500 members. IUCN Commission on Environmental Law (CEL): CEL advances environmental law by developing new legal concepts and instruments, as well as by building the capacity of societies to employ environmental law for conservation and sustainable development. As of May 2008, there are 800 members on this commission. IUCN Species Survival Commission (SSC): SSC advises the Union on the technical aspects of species conservation and mobilizes action for those species that are threatened with extinction. It produces the IUCN Red List of Threatened Species. As of May 2008, SSC's members include over 7,000 species and biodiversity specialists worldwide. IUCN World Commission on Protected Areas (WCPA): WCPA promotes the establishment and effective management of a representative network of terrestrial and marine protected areas worldwide. As of May 2008, there are 1,300 on this commission. The members and commissions work together with a professional secretariat consisting of over 1,100 people in 62 different countries. The Secretariat is headed by a Director General and has a decentralized structure with regional, outpost and country offices around the world. Its headquarters is in Gland, Switzerland. ↑ IUCN Commission on Ecosystem Management, IUCN. Retrieved January 20, 2009. ↑ IUCN Commission of Education and Communication, IUCN. Retrieved January 20, 2009. ↑ IUCN Commission on Environmental, Economic and Social Policy, IUCN. Retrieved January 20, 2009. ↑ IUCN Commission on Environmental Law, IUCN. Retrieved January 20, 2009. ↑ IUCN Species Survival Commission, IUCN. Retrieved January 20, 2009. ↑ IUCN World Commission on Protected Areas, IUCN. Retrieved January 20, 2009. Christoffersen, L. E. 1994. IUCN: A bridge-builder for nature conservation. Green Globe YearBook 1997. Retrieved January 2, 2009.
International Union for Conservation of Nature. 2008. IUCN Website. IUCN. Retrieved January 2, 2009. Mrosovsky, N. 1997. IUCN's credibility critically endangered. Nature 389(6650): 436. History of "International Union for Conservation of Nature"
This page was last modified on 4 March 2018, at 22:29.